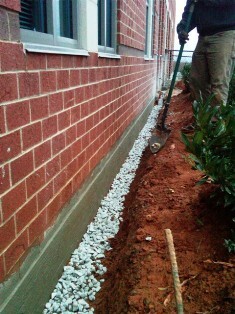 An External French Drain is first installed by digging done through the soil to the bottom of the footer. This can ranged from anywhere between 1 and 20 feet. Once a trench is dug a layer of gravel is laid down around the foundation's perimeter, with the French drain piping laid on top. Gravel is then laid on top of the pipe. 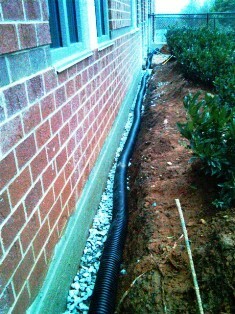 The gravel is placed on the bottom and top of pipe to prevent soil from passing through the pipe. After we apply our two layers of Thuro-Seal on the exposed wall we start backfilling on top of the system, and the gap around the foundation is filled in. Big enough to deliver small enough to listen! ©2019 Apex Termite & Pest Control. All rights reserved.